The Age of Enlightenment is a large scale installation consisting of a colonnade displaying various themes based on religion and conflict. Each of the eight columns is primarily made using castings from commercially available molds. The juxtaposition and alteration of these molded forms create new meaning and iconography. The colonnade leads to a sarcophagus-like structure constructed with plaster molds stacked and corbelled as an ancient stone wall. Examination of the sarcophagus interior reveals the core of the molds, both sacred and vernacular images in deeply carved relief. Iterations of holy themes commingle with mermaids, leprechauns, Easter bunnies and Disney characters. 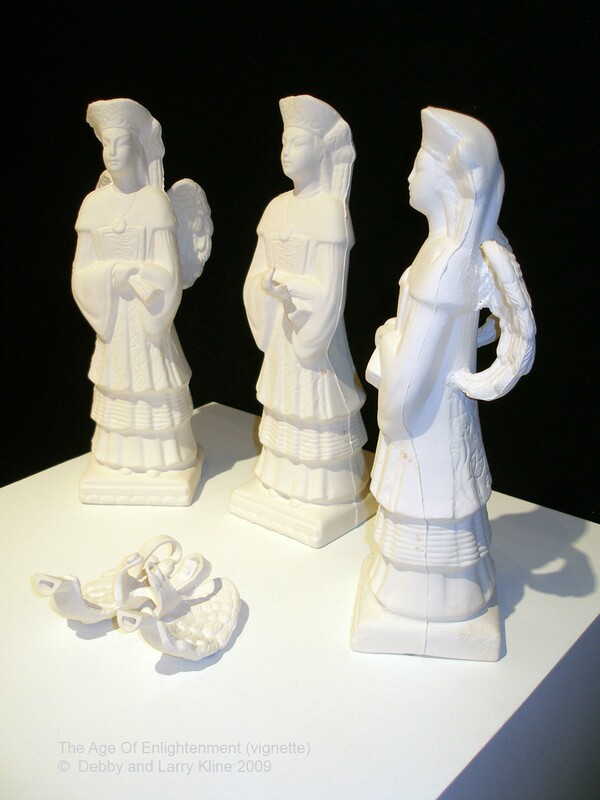 The installation is reminiscent of a visit to a holy shrine. Horns are representative of images of Moses made during the Renaissance and Pre-renaissance. These depictions are said to be due to misinterpretation of biblical Hebrew but could also be considered a deliberate attempt to dehumanize or demonize Jews. The capital is flanked by two portraits of Moses, both reinterpretations of dour old world Santa portrait molds. One figure holds a pair of stone tablets, reminiscent of the Ten Commandments. Across the tablets is inscribed a more inclusive proclamation to “BE NICE,” a commandment free of religious dogma and a reminder of the importance of separation of church and state. On the opposite side of the column is an image of Moses shielding his eyes. This has dual meanings and can be interpreted as “see no evil” or the ritual at the twilight of the Jewish Sabbath when the candles are lit and the eyes are gently shielded. This column is participatory. Visitors write their hopes for the future on slips of paper and insert into the slot at the top of Ho Tai’s belly. One wish per day is sent into the ether via Facebook. Ho Tai, the happy Buddha-like figure, is a grantor of wishes and patron of the poor, weak and young. Located across from the Moses column this features a traditional Islamic pattern, which is incidentally a Star of David turned on its side. The top of the column has been damaged by conflict. A melding of serpent parables from Judeo/Christian and pagan mythologies. The intersection of reproductive science and religion. The capital is supported by three Caryatids, female forms clutching embryonic figures. 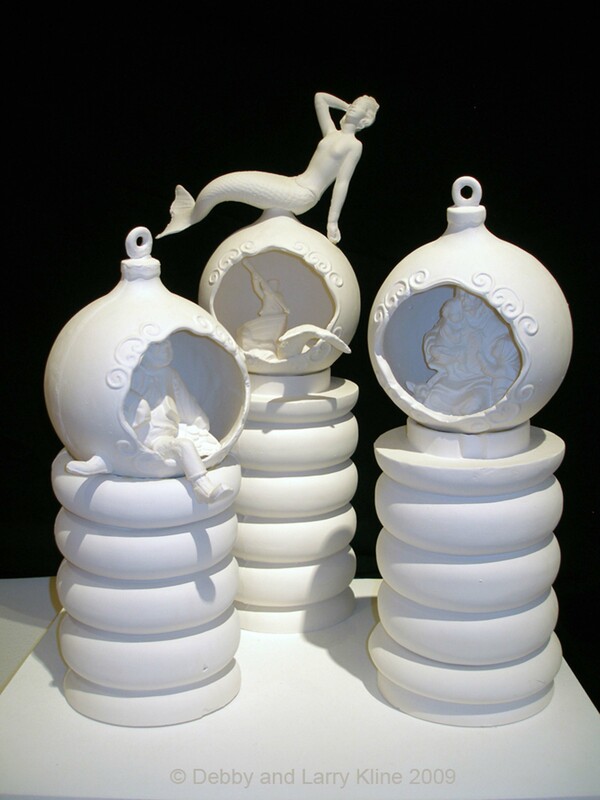 They are framed by a background of sperm fertilizing eggs in sculpted relief. The egg, however, is in the shape of a chicken egg. The base is swimming in Easter bunnies and other rabbits, playing on the metaphor of “multiplying like rabbits” and a reference to the pagan origins of the Easter bunny as symbol of fertility. Praying hands pointing heavenward at the capital for lofty or spiritual aspirations and earthward at the base reflecting earthly desires and carnal needs. Symbolism, language and communication confuse meaning and mirror the chaos at the fall of the Tower of Babel. An angel divines the future with the possibility of using jet-pack wings. A mermaid, Leprechaun and Jesus all contained within large Christmas ornaments. 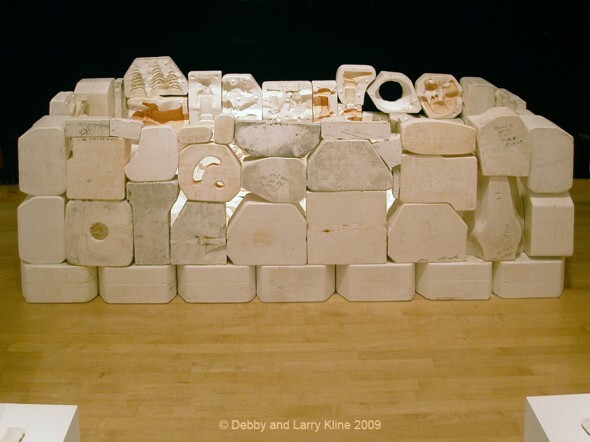 Objects are all idealized imagery of unseen icons. A seaman harpoons the mermaid possibly signaling the death of faith. 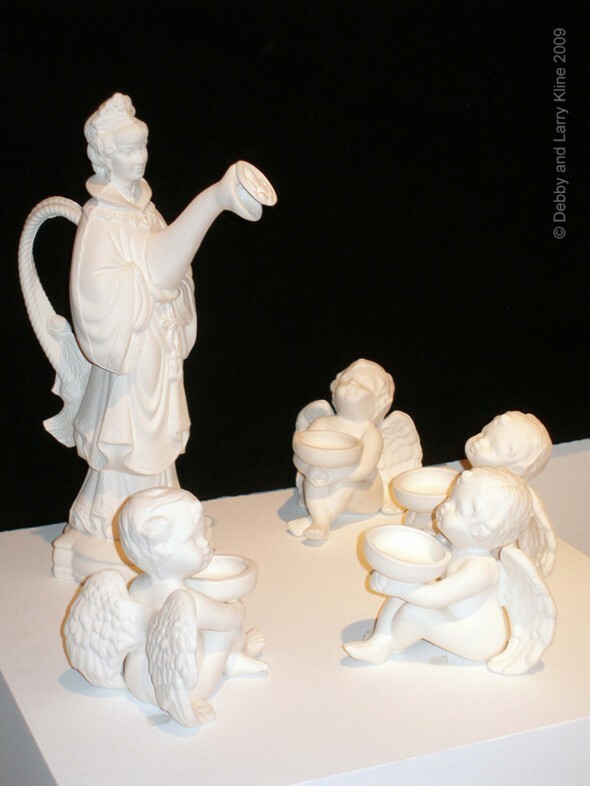 A female figure-turned-vessel pours from her heart to gathered angels who receive nothing. 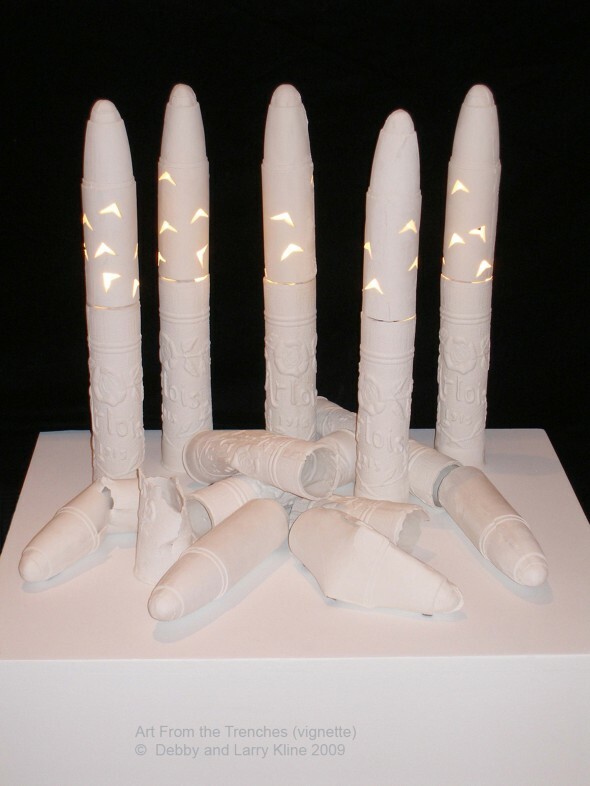 Luminarias made from a mold of a WWI mortar shell. 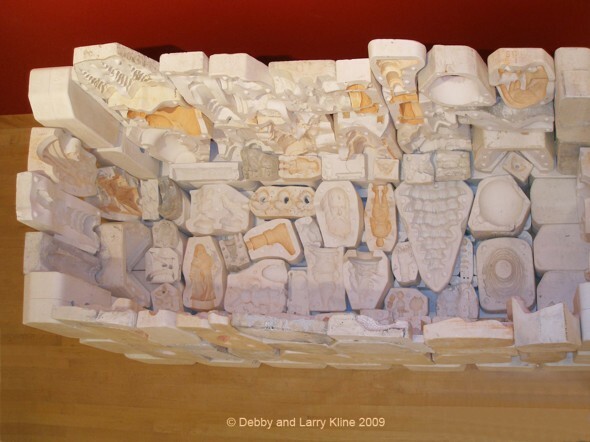 Sarcophagus – plaster molds stacked as an ancient stone wall (located at end of colonnade). April 5, 2011 | Filed under Headers, Projects and Works.